Goals from Andrew Barrowman and Iain Vigurs delivered Jimmy Calderwood's side victory the silverware. 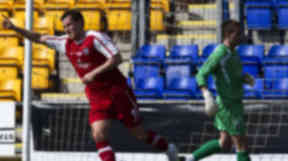 The Highlanders took an early lead through Andrew Barrowman following a mistake by Queen of the South keeper David Hutton. And County didn’t look back as they ran out easy winners with Iain Vigurs' low shot doubling the lead before half time. After only eight minutes hapless Hutton was caught napping on a pass-back which let Barrowman to close him down gain possession and knock home a simple goal. Hutton went some way to try and make amends when he got down to block and smother Gary Miller’s shot. It was one-way traffic as Vigurs then came close before an unmarked Barrowman put headed his effort straight at Hutton. But Willie McLaren then whipped in a corner for Queens but Stephen McKenna's header was cleared off the line as the Dumfries tried to get a foothold in proceedings. However, just when it looked like Queens could battle their way back Ross scored a killer second. Barrowman cleverly played the ball into the path flicked of Vigurs who coolly knocked home. Paul Burns came close for Queens but County's keeper Michael McGovern was equal to the task and saved well.